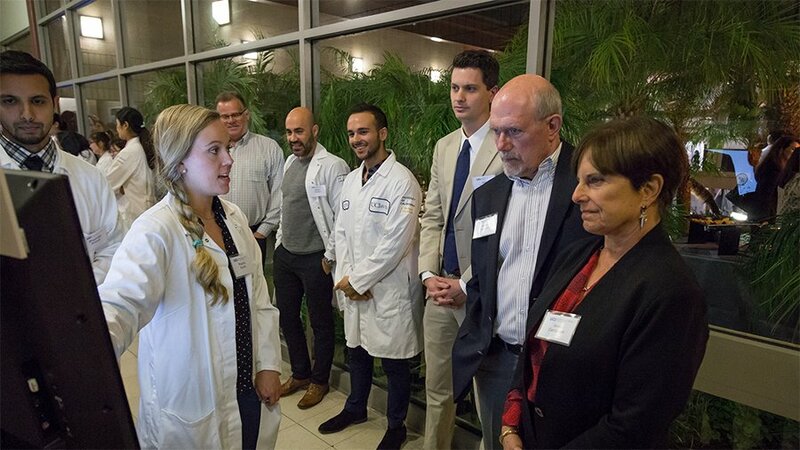 The Beckman Laser Institute and Medical Clinic (BLIMC) held its 30th anniversary, “Multiple Reflections,” on February 9, 2017. The event celebrated the Institute’s past achievements, present accomplishments and future discoveries. Drs. Berns and Beckman raised funds to build the original building, which opened in 1986. UCI Provost and Executive Vice Chancellor Dr. Enrique Lavernia announced the “Convergence Optical Sciences Initiative (COSI),” an $8 million UCI investment in optics and photonics. “Our goal is to create exciting new opportunities with a broader impact on scientific discovery and human health,” said Lavernia. COSI will partner BLIMC with the schools of Engineering, Physical Sciences, Biological Sciences, and Medicine, in collaboration with UCI Applied Innovation. Over the next five years, COSI will hire at least five new faculty and create a dedicated space for academic/industry collaboration and engagement. The first COSI hire is Dr. Chris Barty, professor of Physics and Astronomy, who is a pioneer in advanced laser light source technologies. Barty, who joined UCI and the BLIMC on July 1, 2017 has already launched Lumitron Technology Inc., a new venture that will commercialize his discoveries. “The ability to fashion ways to better diagnose and treat diseases that have gone on without adequate interventional options is an area where I think the intersection between photonics and medicine is going to have an impact,” said vice chancellor for health affairs and CEO of the UCI Health System, Dr. Howard J. Federoff. “This is increasingly clear as we understand more about the etiology or underlying basis of disease.” According to Federoff, the potential is to develop non-invasive, low-cost screening technologies to detect diseases pre-clinically, before a doctor sees them. Federoff cited screening for microscopic melanoma before it comes to clinical attention and using near-infrared light for non-invasive brain imaging. “I think this is just the proverbial tip of the iceberg,” said Federoff. Attendees toured 17 interactive technology demonstrations featuring unique inventions by BLIMC faculty. For example, researchers in the lab of Dr. Brian Wong, professor of Otolaryngology, Biomedical Engineering (BME), and Surgery, showed how bioelectric technologies combined with biophotonic imaging could lead to new minimally-invasive surgical approaches for repairing and remodeling cartilage, tendon, ligament, skin, and fat. The lab of Dr. Elliot Botvinick, associate professor of BME and Surgery, is developing an artificial pancreas for type 1 diabetics. Their innovative approach will provide patients with implantable scaffolds that house pancreatic islet cells combined with oxygen-sensing microparticles. Optical sensing of microparticle activity is used to monitor oxygen levels and blood vessel growth. “It is like building the house first, and then moving in,” said researcher Dr. John Weidling. Rachel Gurlin, a graduate student, has just published her first paper on the new approach. Her sister has type 1 diabetes. “I cannot imagine studying anything else,” said Gurlin.